M/s Greencrest Financial Services Limited has been incorporated on 15th February 1993 and previous name of Company was M/s. Marigold Glass Industries Limited. The Company has changed its name to M/s. 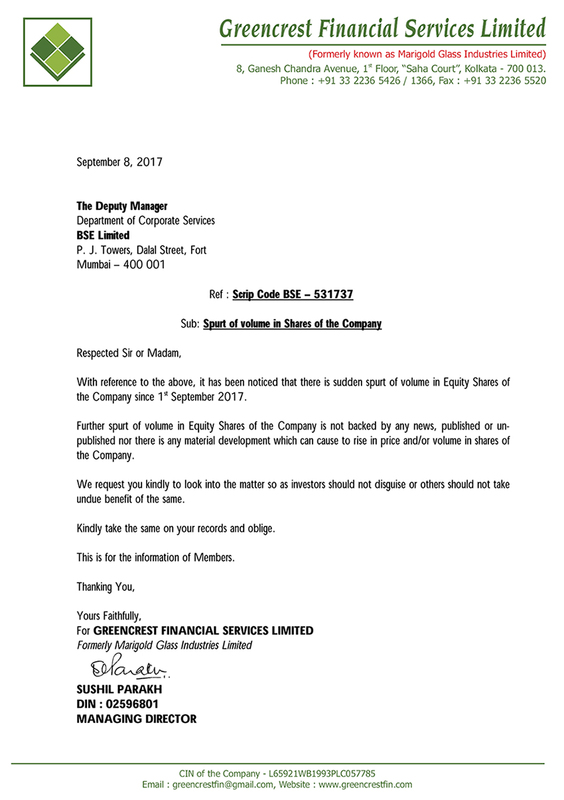 Greencrest Financial Services Ltd. as per approval received from ROC, Kolkata vide its certificate of change of name dated 25th May 2013. Even BSE and RBI has approved the change in name of the Company. Our Company is listed on BSE Limited (BSE) and Calcutta Stock Exchange Limited (CSE). Our Company is one of the RBI registered non-deposit taking NBFC and is into the business of NBFC activities as well as investing its surplus fund into shares & securities.